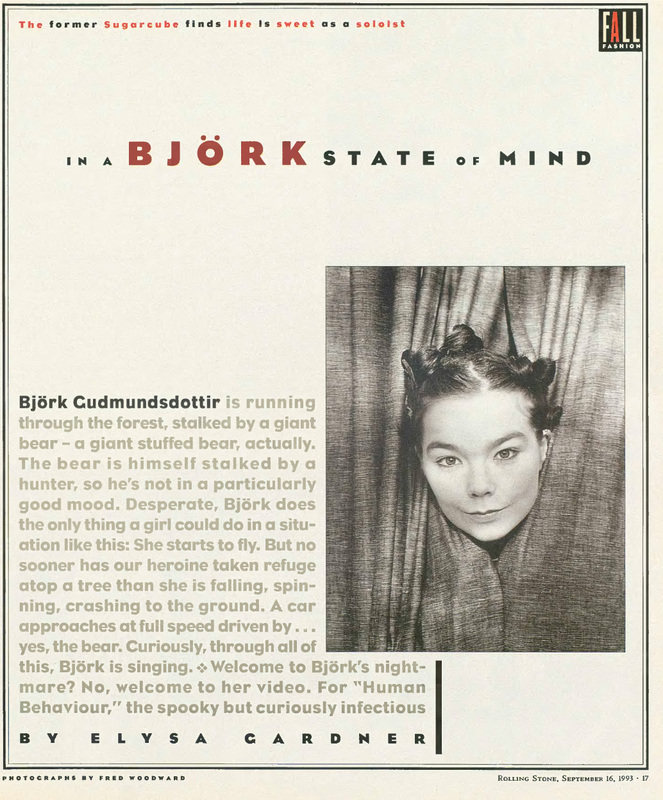 Björk Guðmundsdóttir is running through the forest, stalked by a giant bear—a giant stuffed bear, actually. The bear is himself stalked by a hunter, so he’s not in a particularly good mood. Desperate, Björk does the only thing a girl could do in a situation like this : She starts to fly. But no sooner has our heroine taken refuge atop a tree than she is falling, spinning, crashing to the ground. A car approaches at full speed driven by...yes, the bear. Curiously, through all of this, Björk is singing. Welcome to Björk’s nightmare ? Björk is ensconced in a London studio at the moment, safe from the forces of nature depicted so strikingly in her video, for which she gives director Michel Gondry most of the creative credit. (“I told him, ‘I want a bear and textures like handmade wood and leaves and earth, and I want it to seem like animation.’ Then I backed out.”) She is suffering from the flu, though, and she takes a break from rehearsals for her upcoming tour to do an interview, a tender throat and a bad case of the sniffles make her high-pitched voice sound more childlike than it normally does. As lead singer for the band that put Iceland on the alternative-rock map, Björk was able to parlay that adorable chirp into a vocal style that was a force of nature all its own— and not always a gentle one. Although she can purr as sweetly as the most contented kitten, the Sugarcubes’ most valuable asset can also growl with a ferocity worthy of that mad bear ; and her impish charm derives largely from her obvious pleasure in doing the latter. Not that it is actually a debut—back in 1977, the 12-year-old Björk put out a collection of children’s songs, including a few she’d written herself. And it’s not because it’s her first album without the Sugarcubes—in 1990, she hooked up with a few Icelandic jazz virtuosos and recorded a compilation of songs from the ‘50s and ‘60s called Gling Glo. Instead, Debut earned its title by being the first record that Björk has made on which she supplements the growls and purrs with other contributions that are, for her, more significant. “What I want to do now—what I wanted to do with this album—is make music,” she says. “That means writing music and arranging things.” And that means something entirely different from adding melodies and writing lyrics, as she once described her collaborative work in the Sugarcubes. “The way I’ve been explaining the difference is by comparing it to a party. You know the people who are going to be there, so you get all dressed up and maybe bring a bottle of wine or some tapes. And you go, and you have great time ; and if the curtains aren’t the colour you like or people are telling jokes that aren’t your kind of jokes, you’re not going to stand on a chair and tell everybody what to say or do. That’s kind of what the Sugarcubes’ music was like. We’d been friends from way back—some of us have known each other for, like, 15 years—and there was no way I was going to tell anyone in the band what to do. Because I respect them, and I just love them as people, you know ? The baby that that affair engendered had little in common, aside from Björk’s voice, with the glorious, guitar-ridden cacophony that distinguished the Sugarcubes’ best work. 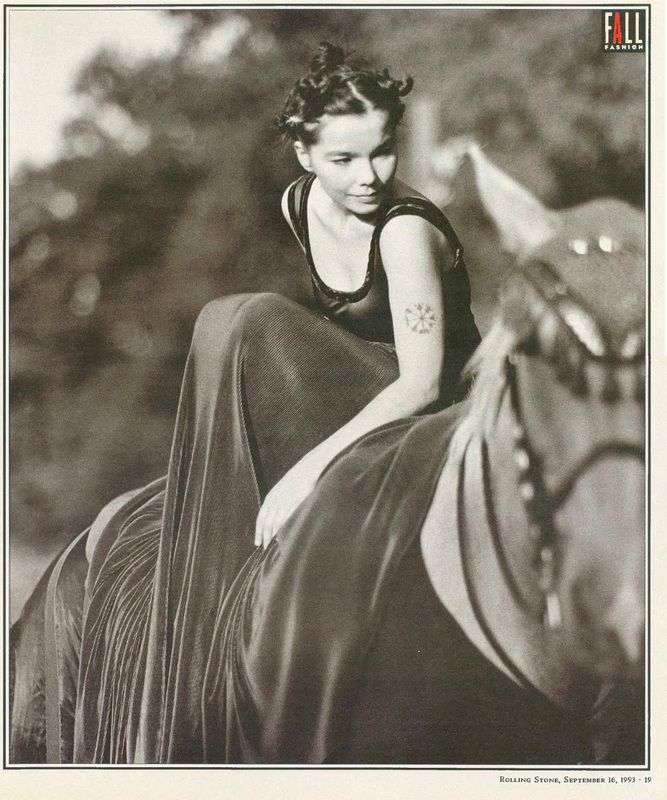 Graceful and rhythmic throughout, Debut alternates insidious dance tracks like “Crying” and “Big Time Sensuality” with ambient numbers like “Come to Me” and “Venus As a Boy.” Jazz harpist Corky Hale, a septuagenarian who’s played piano for Frank Sinatra and Billie Holiday, accompanies Björk on her lovely ebullient rendition of “Like Someone in Love” ; other guests on the album include members of a Bombay, India, film-studio orchestra and Oliver Lake of the World Saxophone Quartet. “I’ve never listened to guitar rock, really,” Björk says. 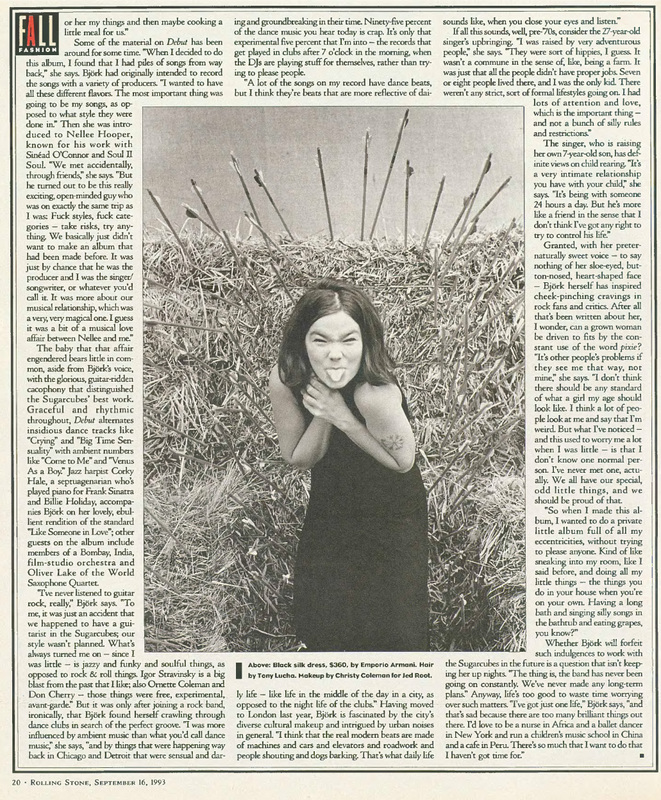 “To me, it was just an accident that we happened to have a guitarist in the Sugarcubes ; our style wasn’t planned. What’s always turned me on—since I was little—is jazzy and funky and soulful things, as opposed to rock & roll things. Igor Stravinsky is a big blast from the past that I like ; also Ornette Coleman and Don Cherry—those things were free, experimental, avant-garde.” But it was only after joining a rock band, ironically, that Björk found herself crawling through dance clubs in search of the perfect groove. “I was more influenced by ambient music than what you’d call dance music,” she says, “and by things that were happening way back in Chicago and Detroit that were sensual and daring and groundbreaking in their time. Ninety-five percent of the dance music you hear today is crap. It’s only that experimental five percent that I’m into—the records that get played in clubs after 7 o’clock in the morning, when the DJs are playing stuff for themselves, rather than trying to please people. Granted, with her preternaturally sweet voice—to say nothing of her sloe-eyed, button-nosed, heart shaped face—Björk herself has inspired cheek-pinching cravings in rock fans and critics. After all that’s been written about her, I wonder, can a grown woman be driven to fits by the constant use of the word pixie ? “It’s other people’s problems if they see me that way, not mine,” she says. “I don’t think there should be any standard of what a girl my age should look like. I think a lot of people look at me and say that I’m weird. But what I’ve noticed—and this used to worry me alot when I was little—is that I don’t know one normal person. I’ve never met one, actually. We all have our special, odd little things, and we should be proud of that.